The second edition of NAV Customer Day has come to an end. 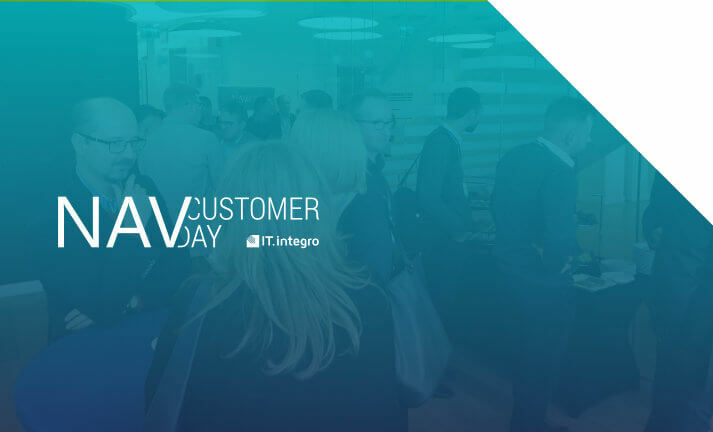 The second edition of NAV Customer Day – a conference dedicated to IT.integro’ customers – was held on 13 November, 2018. This year, the meeting was organized in Microsoft’s head office and more than 50 guests from 30 companies participated in the sessions. The organizers of the conference focused mainly on the future of Microsoft Dynamics NAV and changes implemented in the new versions. They also highlighted the directions for the development of modern organizations, the market of business solutions and Microsoft strategy. During the opening session, Piotr Śledź, IT.integro’s President of the Board said that, even though not everyone was aware, we are all part of a digital revolution and changes are inevitable. If properly managed and well implemented, changes can be beneficial – drive economic growth and improve staff efficiency. The new reality of business brings unlimited possibilities supported by innovative technology – tools and services, available anywhere, anytime. Solutions delivered by Microsoft are an indispensable element of the digital transformation. They are used to streamline all processes within the organization in the following areas: sales, customer service, manufacturing, finance and distribution. transformation of products, services and business models. Microsoft Azure – a set of innovative and efficient cloud-based services which enable the freedom of designing, implementing and managing applications. The panel discussion, led by Sławomir Michalak, Customer Sales and Administration Department Manager, concentrated on new features in Dynamics NAV 2018, as well as major changes and tools in the Polish Functionality module. Sławomir Michalak pointed out that the module was constantly updated and developed. Since its premiere with Microsoft Dynamics NAV 2013 edition and with its subsequent versions, it has been enhanced with a number of capabilities. At the moment, it is the most comprehensive and competitive package of features. One of the main topics discussed during this session was the availability of platforms for Dynamics NAV (such as Microsoft Azure) and DataCenter and on-premises services. The presentation was delivered by Radosław Dudziak, Customer Sales and Administration Specialist. The speaker identified the possibilities of integration with Microsoft solutions: Office 365, PowerBI, Dynamics 365, Microsoft Flow, Microsoft Azure and Machine Learning. During the final part of the Dynamics NAV 2018 session, Wojciech Kwiczor, Products Development Manager presented some of the new features in the ERP system. He demonstrated how to create an item card, how to convert a purchase order from a sales order and how to develop business applications by using PowerApps. The topic of the next session was new capabilities in the latest Dynamics NAV version, which is now officially named Dynamics 365 Business Central. The speaker to get the floor was Krzysztof Zieliński, Enterprise Key Account Manager at IT.integro. During this session, the concept of Industry 4.0 as the key trend of the modern economy was addressed. Industry 4.0 is based on the idea of close cooperation and integration of multiple systems as part of a network of people and devices by using innovative technology, the internet of things (IoT), big data, cloud computing, artificial intelligence (AI) and augmented reality (AR). Microsoft delivers powerful and efficient business solutions. By integrating functionalities of Dynamics 365, Microsoft 3565, Microsoft Azure and products developed by partners, business owners gain a number of possibilities to optimize their operations and stimulate further growth. better understanding of the market and needs of the clients. The next presentation focused on changes in licensing models and it was led by Przemysław Kniat, Sales Manager from IT.Integro. As for licensing models, unlike previous Dynamics NAV versions, Dynamics 365 Business Central will be available for purchase with named users assigned to two packages: Premium or Essentials. Additionally, the sale of licenses for Dynamics NAV, as well as updates to Dynamics NAV 2018 version will be possible until 1 April, 2019. After this time, only Dynamics 365 Business Central version will be available for implementation. The last session was entirely concerned with the organizational issues: framework for cooperation, changes in the communication policy and licensing models. NAV Customer Day brought together a wide range of customers and ERP system users. The event proved to be a significant communication platform to exchange knowledge, experience and opinions between Dynamics NAV experts and representatives from different companies and industry sectors. We expect the next edition to be launched in 2019.